We want to leaflet shopping areas this Saturday and local tube stations after work next week – please get in touch if you can take leaflets to start a session – we’ll find people to join you. We would like to leaflet key shopping areas at 12noon – 1pm on Saturday. · Can you help in Archway / Kentish Town / Holloway Nags Head / Finsbury Park / Wood Green shops? We want to leaflet tube stations 5.30 – 6.30pm on Monday – Wednesday next week. · Can you help cover Archway, Tufnell Park, Kentish Town, Highbury & Islington, Holloway Road, Finsbury Park, Wood Green and Highgate? Please sign the petition to stop the Whittington Hospital Sell-off! 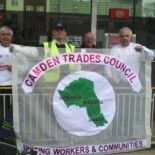 This entry was posted on February 25, 2013 by CAMDEN TRADES COUNCIL.